Located south of Syracuse, NY, New Heritage Woodworking focuses on custom timber frame design, fabrication, and installation. We also offer installation of structural insulated panels and millwork for our frame and panel packages as well as timber framed garden structures such as pergolas and pavilions. The unique look and feel of a finely crafted timber frame is one of many reasons we are dedicated to the art of timber framing. Creating these beautiful structures has become our chosen life’s work. In addition to their timeless beauty, timber frames are a “green” technique of building, support the local economy and offer unsurpassed durability and strength. attractive, durable goods that will be passed from generation to generation, created in a way that promotes a healthy, diverse and sustainable environment and with a business philosophy and ethic that helps the surrounding community. 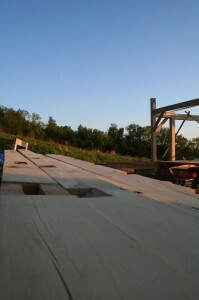 Our mission is to provide the highest quality wood products and services possible and to inspire new traditions in craftsmanship while leaving a legacy of environmental stewardship and fair and equitable business practices. Many of our customers say that words and pictures don’t do justice to the warmth and character of our frames, so we strongly encourage you to arrange a visit to one of our current or past projects or come see our various pergola designs. Let us share our passion for the craft of timber framing with you.